Thinking about Germany for this year’s Thinking Day celebration? 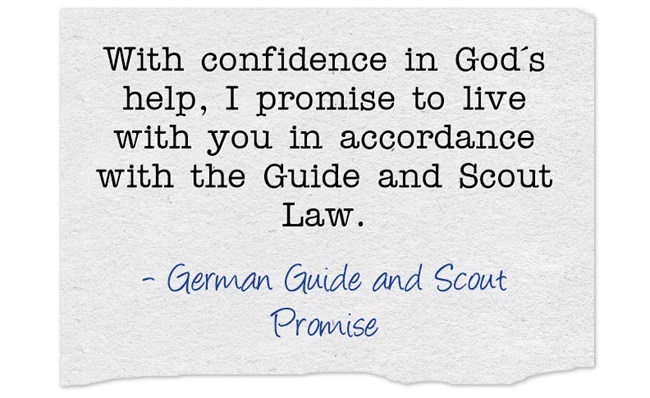 I found a terrific resource online to learn about Guiding in Germany. In Germany, Boy Scouts and Girl Scouts are not in separate organizations. They are in one unified group, called Bund der Pfadfinderinnen und Pfadfinder (BdP) (Association of Girl Guides and Boy Scouts). Here are some highlights about scouting in Germany from “About Guiding and Scouting in Germany” from the Ring Deutscher Pfadfinderinnenverbände (RDP) (Union of German Girl Guide Associations). Bund der Pfadfinderinnen und Pfadfinder (BdP) (Association of Girl Guides and Boy Scouts) The BdP is an inter-denominational merged Association and partner in the RDP (Union of German Girl Guide Associations). The Association is open to all girls and boys. It has teams of male and female leaders at all levels, and local groups have the right to decide whether they wish to work in mixed or in separate groupings. Girls and boys can take part in activities from the age of 7 years. In the youngest section, from 7 to 11 years, they are called ‘Wölflinge’ (Cubs/Brownies). Playing is the focus of their activities, and in their weekly meeting or at camps, there is never a dull moment for them. Many interests are covered in the Guide / Scout section from 12 to 16 years. Hikes, travelling, and camps are introduced as major outdoor activities for this age group. In the ‘Sippe’ (patrol), the small unit in the Scout /Guide section (Pfadfinderstufe), young people are encouraged to develop their independence and self-reliance. Those over 16 years, in the Ranger / Rover section, are widely selfsupporting in their activities. They look beyond the realm of the group, and are active in caring for the environment and the community. Adults find their place in BdP as leaders, in lobby groups, as sponsors or specialists who help the group out on special occasions. Activities help to acquire technical, physical, musical, social, and spiritual abilities; help to develop an individual personality and gain self-confidence; facilitate living and problem solving in a group; strengthen the ability to take over responsibility, political awareness, openness and creativity; and heighten awareness of the environment and one´s own community. 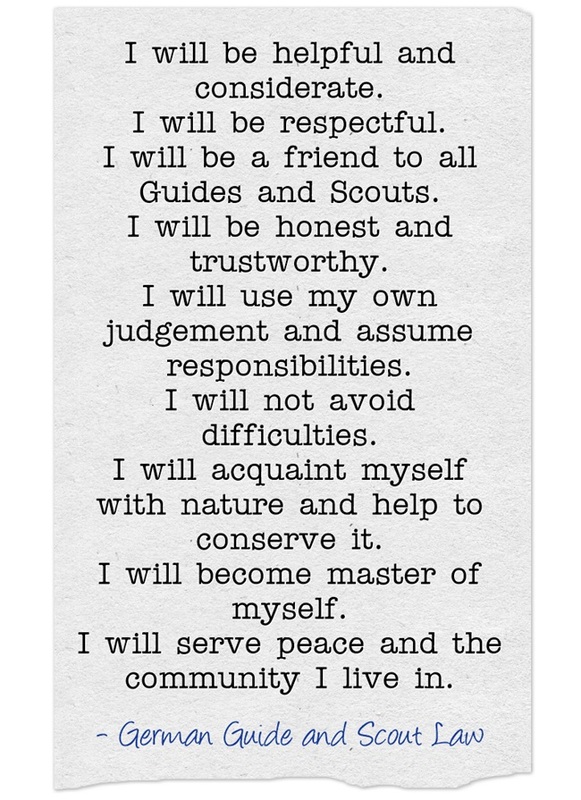 As Guides and Scouts, they are active in projects for their society and the environment. The emphasis is not only to contribute international partnership on a bilateral basis with Poland and Kazakhstan, but also on working closely with strong youth work to enable girls and boys to find their place in society and develop their fullest potential as world citizens. Put all chairs in a circle with only limited space between them. The girl with the scarf is in the middle. Everyone else sits on her chair. Those sitting get themselves numbers equal to the number of girls sitting (e.g. if 10 girls are sitting the numbering is from 1 to 10). As soon as the girl in the middle are blindfolded, all other girls change their seats so that the original order changed. Everyone has to be absolutely silent now. The one in the middle names to numbers (e.g. 2 and 8). The two girls owning No 2 and No 8 have now the task to change places without being caught by the one in the middle who of course tries to reach one of them. It’s not allowed to sit down again after you have ones stand up from your chair or to leave the inner circle and of course everyone else has to be very very silent to give the one in the middle a chance. As soon as the two girls have successfully changed places without being caught, the one in the middle tries it again saying two other numbers. As soon as the middle one caught one of the changing girls this one has to go into the middle and she “hands over” her number to the former middle one. After the eyes are covered again all girls change their seats again and the game starts from the beginning. Cook the pudding as directed on the package. Pour one layer into a bowl, put cookies on top and cover them with a layer of jam. Repeat that until the pudding is finished. Let it cool before eating. Don’t miss out on new ideas. Sign up for our enewsletter for more great ideas! What other Thinking Day ideas do you have for Germany? Share your ideas and pins below! Disclaimer: This post contains affiliate links, which help support our scouting adventures! How fun! You will have to post the recipes. I have a great 5th generation apple streudel recipe (forgive me if it’s not German!) That I can share. Takes a lot of work but worth it. I will definitely post the recipes. Oh and I’d love the recipe for the apple streudel. There’s one dessert we make occasionally in my family called “Covered Apple Cake” (english translation, the actual name I can only pronounce and have no idea how to spell in German). It’s a lot of work like you mentioned, but so good. I could work all afternoon on it, and it’s gone in minutes lol. Wow how fun! I was a Spark leader for 12 years so love finding ways to teach the girls about guiding in other countries. Do you ever plan ahead! I was so confused when I saw stuff for thinking day! I was thinking of doing Germany for WTD but was trying to google a Female Leader (past or present) who was also a girl scout in Germany. Not coming up with anything. Maybe not typing the right thing in. Do you have any names or could you point me in the right direction. Thanks.